Oh you married a chef? Is it stressful cooking for him? Do you always have extravagant meals? Yes. Very, very rarely. When he gets in one of his moods yes. Those who can’t cook surround themselves with people who can. Seriously my best friend and my husband are both professionally trained chefs. As in they went to culinary school and have the degree to prove it. It’s a good thing too because I can’t cook to save my life. Seriously, the first think I ever tried to cook for my husband (way back when we had only been dating for a few months) was Mac & Cheese and I still managed to screw that up. If you’ve ever wondered what Mac & Cheese soup would taste like I’ll spare you the terror, it’s awful. However, since I am an adult and my husband works ridiculous hours as a restaurant manager I have had to adapt and learn to produce edible meals in order to survive. Basically it came down to either crock pot meals or 2 to 3 recipes that I could manage to reproduce and still taste delicious. The limited number of choices for dinner became even smaller after B came along because extra time was gone. Eventually even I got sick of having the same few things over and over again. That’s when I came across Hello Fresh. Before I get any farther I just want to clarify I am in no way being reimbursed for this post. It is a completely honest review. I just happen to LOVE the company. Hello Fresh quite literally changed my life. If you’re not familiar with the company you probably don’t have a Facebook, but they are a meal delivery service. You sign up and once a week you get a box with everything you need for either 3 or 5 meals in it. We do the 3 meals for 2 people box either once a week or bi-weekly depending on my mood and the recipes they are offering. The price is incredibly reasonable when you break it down. $10 per person per meal plus if you click HERE and sign up for a new account you can get $40 off the first box. After adjusting our grocery shopping to not having to buy dinner for half the week we are still paying the same or even less than we were before sometimes. Leading up to when they ship off the box you can pick from a small selection of meals to be delivered in your box. I love that you can skip as many weeks as you want without any limitations or fees. So if money is tight or I just don’t like enough of the recipes I can skip it as long as I do it 4 days in advance. Each large box comes with the meat sealed separately in air tight packaging under these huge blocks of ice that can keep everything cold for several hours in case you aren’t home when the package is delivered, the ingredients for each recipe in separate boxes, and a recipe card for each meal. You can also access the recipe through the app but I find the 8 1/2″ x 11″ recipe card much easier. I just prop it up against something as I cook. The directions and pictures break everything down as much as possible. Even someone who is as TERRIBLE at cooking as I am can manage to follow along. My most recent favorite meal was this Thai pork stir fry. 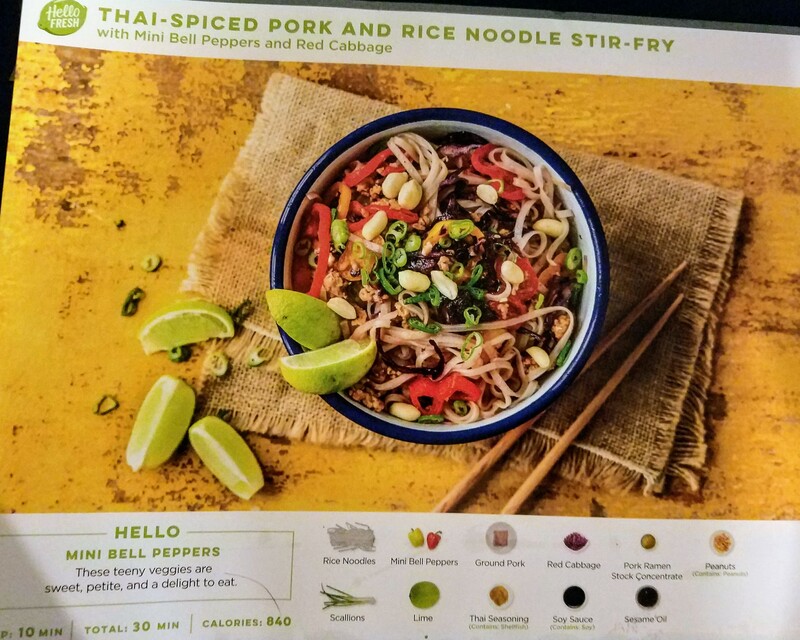 Hello Fresh has made me fall in love with all things stir fry. 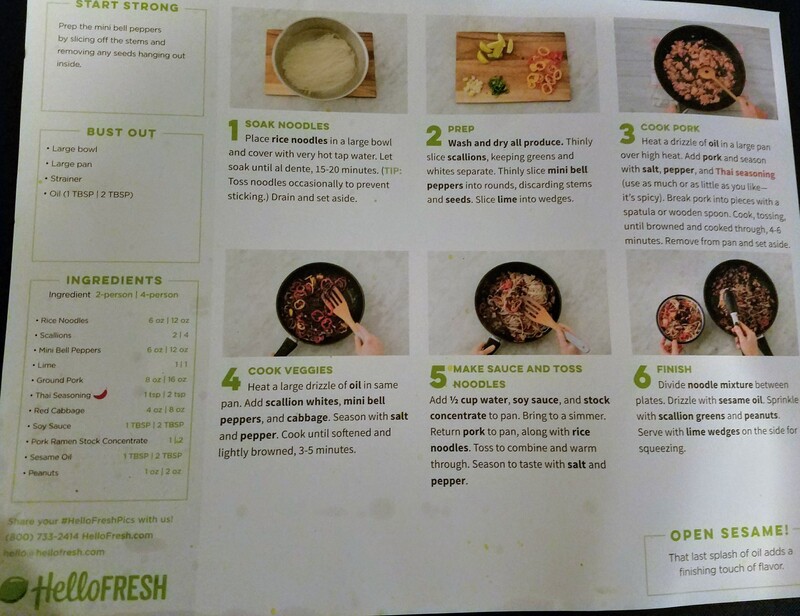 There is a picture of the individual meal box and all of the ingredients. I love that they only send you what you need so you don’t have to worry about anything going bad or trying to figure out how to use an entire head of garlic when you only need a few cloves. I rarely use the app when actually cooking a meal but each step has a timer preset so all you need to do is hit start and move on to the next step. The app will alert you when the time is up without being too disruptive. Final product. Y’all this was DELICIOUS! I have yet to find a recipe that was difficult to follow or that I didn’t like. Hello Fresh has totally brought me out of my comfort zone with food and my husband sure appreciates having more than 5 options for dinner! If you want to try it click on THIS LINK to get $40 off your first box. If you do the 3 meals per week for 2 people that would put your first box at $20. You can’t go wrong with that. Occasionally I get free boxes to send to people. It’s only a limited number of boxes each time but if you want one drop your email and I’ll send them as I get them. Previous postLegally Mom? But How?